Glaisher added projects: acl*sre-team, MediaWiki-JobQueue. Glaisher added a project: WMF-JobQueue. Glaisher removed a subscriber: Betacommand. Apr 30 16:44:53 <legoPanda>	Betacommand: I see 10 million refreshlinks jobs??? Apr 30 21:49:58 <legoPanda>	AaronSchulz: do you know why enwiki has 11m refreshLinks jobs queued? May 07 16:25:20 <T13|mobile>	[16:24:33] There's concerns that the enwp job queue is stuck since it's growing so much and pushing 20 million. Can someone peek and poke at it as needed? May 07 16:40:36 <MatmaRex>	T13|mobile: for example: (simplifying, since i don't know exactly how it works) say you edit a template used on 200 000 pages. rather than generate 20 000 jobs to update the pages immediately, which itself would take a long time, MediaWiki instead generates (say) 100 jobs, each of which generates 2000 jobs, each of which actually updates a page. May 07 18:15:52 <T13|away>	legoktm: would my guess that part of the reason the jobqueue is still ever expanding might be related to SULF? May 07 18:39:18 <T13|away>	[18:15:52] legoktm: would my guess that part of the reason the jobqueue is still ever expanding might be related to SULF? May 08 18:16:16 <Betacommand>	Are ops aware of the enwiki job queue issue? I did a quick look around the job runners, and they seem to be running fine without being starved of resources. A point of note is that it apparently is only the refreshLinks that are piling up. Krenair raised the priority of this task from High to Unbreak Now!. EoRdE6 added a subscriber: EoRdE6. Now past 25.6m. I made edits to templates as far back as April 19th that haven't filtered through to the articles yet. 3gg5amp1e added a subscriber: 3gg5amp1e. aaron mentioned this in rMW140a0bd562d4: Made triggerOpportunisticLinksUpdate() jobs make use of parser cache. Job queue seems to have begun to drop slowly, still near 29 million jobs though. aaron mentioned this in rMW914d71f3ccbc: Temporary hack to drain excess refreshLinks jobs. Now en.wiki is merely at 21 millions. According to https://wikiapiary.com/wiki/Wikipedia_%28en%29 , it started dropping this morning at 8 UTC; at this speed, the queue should be drained in a matter of hours. 15 million. Checking https://en.wikipedia.org/w/api.php?action=query&meta=siteinfo&siprop=statistics let's see what it looks like tomorrow morning. now down to 78 jobs! do we consider this done? @ArielGlenn how are you coming up with 78 jobs? I haven't seen it go below 1.15 million. I still consider it done, but it's still a little higher than normal according to the graphs. And, for what it's worth, still template edits from back as far as April 19th that haven't filtered through. I don't know what order it works through the jobs, but I would have assumed oldest to newest. @Technical, I was watching the estimate provided at the en wp link I mentioned above. Given that it's only an estimate but still. 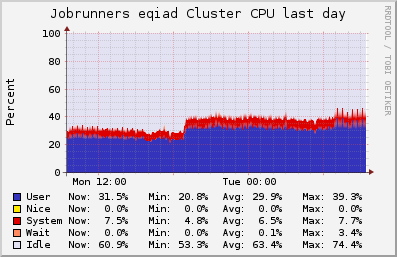 I thought that that was no longer an estimate when using redis job queue. If you check the graph at https://wikiapiary.com/wiki/Wikipedia_%28en%29 for exact timings, you'll see that 27 millions jobs were consumed in just 19 hours; that's probably the effect of ba91f0a2d33956cc7e745fbee8b298150eb27287 which skipped certain "redundant" jobs. This bug was resolved when the abnormal mass of jobs has been removed. In the next 24 hours the decrease was about 600k, so we're back to business as usual even though there is still some backlog to recover. Is it possible to change the DESCRIPTION at the top of this page? Yes, click the edit task button in the top right hand corner, @Wbm1058.